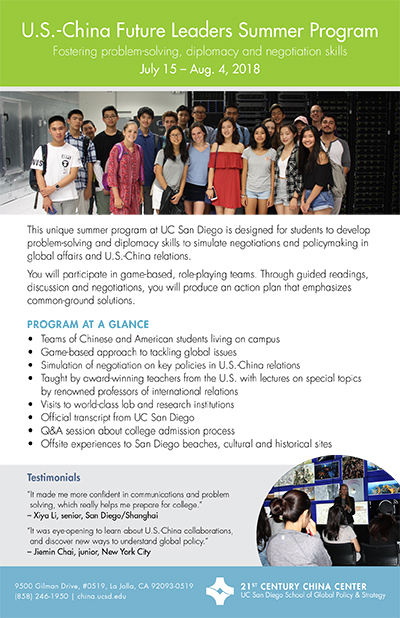 Based at the UC San Diego School of Global Policy and Strategy (GPS), This unique summer program at UC San Diego is designed for high school students to develop problem-solving and diplomacy skills in global affairs, especially as they pertain to the roles of China, the U.S., Pacific and Indo-Pacific region countries including Mexico and India. In this program, you will participate in a digital simulation platform and role-playing teams. Through guided readings, lectures, discussion and negotiations, you will produce anaction plan that emphasizes common-ground solutions in four areas: climate change, energy innovation (e.g. renewable energy, electric vehicles, etc. ), artificial intelligence and international trade. The program tackles four critical issues of global importance. During the interactive game play you will learn about the latest scientific research and discoveries that have promoted innovation and influenced global policy decisions in one of the four focus areas: climate change, energy innovation, artificial intelligence and international trade. All participants will receive an official transcript certifying one pre-collegiate credit from UC San Diego. Participant surveys were conducted before and after the program to determine what effects it had on the attitudes and behavior of the participants. Surveys were conducted in previous programs that focused on U.S.-China bilateral relations. Overall, the results showed more favorable attitudes toward the counterpart nation, and increased interest in peaceful cooperation between the two countries on a range of global policy issues. Additionally, students developed increased confidence in their problem solving and conflict resolution skills, and in their cross-cultural communication and critical thinking abilities. Focus group reflections showed students value most their interactions with other students, especially those from their counterpart country. Participate and attend social activities and special events that will make your experience unforgettable, including team-building adventures offered by UC San Diego Challenge Course, a visit to Birch Aquarium, beach party and Old Town San Diego. Kristen Druker is an award-winning high school teacher and founder of Peaceconferencing, a game-based educational experience for youth supported by a simulation platform. She won the Golden Bell Award from the California School Boards Association for innovative curriculum and was honored as one of the first California State Mentor Teachers. Susan Shirk, Chair of 21st Century China Center at UC San Diego’s School of Global Policy and Strategy and former deputy assistant secretary of state responsible for U.S. policy toward China, Taiwan, Hong Kong and Mongolia in 1997-2000. Gordon McCord, an economist who works at the intersection of development economics, public health and the environment. Shirley Meng, professor of NanoEngineering and Materials Science working on new materials for energy storage and conversion. Lei Guang, director of 21st Century China Center at UC San Diego’s School of Global Policy and Strategy. Early decision deadline for applications was April 1. Applications will still be accepted on a rolling basis until April 30. Please click here to complete the full application and upload all required attachments. "I was accepted to 5 out of the 6 schools I applied, and I think a large part of that was due to my participation in the U.S.-China Future Leaders Summer Program. It changed my perspective not only about the topics we discussed but how I saw the world as a whole."